This is Part VII, the final part, of a multi-part series chronicling my motorcycle adventure from Tokyo to Sapporo and back again. My last day of the trip was fairly uneventful. I woke up early to the stress of a cold damp morning. It was misting outside, but not too bad. I thought I’d be okay. I spent the better part of an hour looking for a bank in the morning before giving up and looking for a gas station that I could use. In Tokyo, getting gas is very easy. It’s almost always full service, however, when you are out in small towns, it’s very hard to find. Using a self serve gas station in Japan is actually quite difficult. You have to be able to read Japanese, and even then, you might have trouble understanding the instructions. Unlike Canadian gas stations where you either pay with a credit card, or go inside to pay first, I have no idea how it works in Japan. Sometimes they give you a card which is essentially a member’s card. You use it to “login” to the pump and after you pay at the pump, you take the card to a money machine to get your change. I’m not too sure if this is the same at every station, but it’s very confusing and hard to understand, at least for me and my limited Japanese. Either way, I ended up taking a chance and jumping onto the Expressway. The majority of PAs and SAs don't look this nice. On my return trip, I had nothing to do except “race” back home. It started off with me wearing a long sleeve cotton shirt, a T-shirt, my jacket, and a neck warmer. Every two hours, I had to take off at least one layer of clothing. 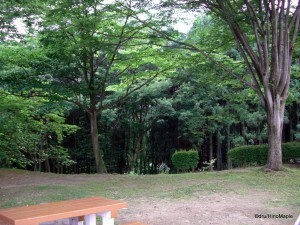 By the time I reached the Tokyo area, I was starting to sweat, so I changed from a cotton T-shirt to a sports shirt. I couldn’t believe how different things can be, and how fast you can experience is on a motorcycle. If I was in a car, I wouldn’t notice anything until I stopped and got out to rest. I also noticed a noticeable jump in traffic as I got closer and closer to Tokyo. Every hour or so, the number of cars would at least double. In Hachinohe, I saw maybe one or two cars on the road with me. By the time I reached Tokyo, it was bumper to bumper traffic and 6 lanes wide. This day, I still got a little lost, but not too much. I kept thinking my final turn would be much earlier, but I kept going and sooner or later I reached my destination. Traffic was very heavy when I reached Tokyo and going between the cars saved me at least one hour. 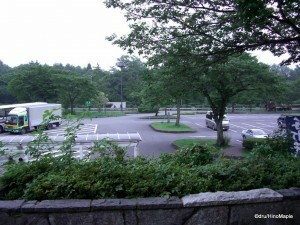 Typical view from the rest area. My final impression of this visit is to never do it again, or at least be better prepared. I truly enjoyed many aspects of this trip, but there were many other points that I hated. It’s something that I had to do, and something that I recommend people to try. Maybe not doing the same distances that I did, but to enjoy the open roads of Japan. Getting to the back country is something that many people never see. It’s a different way of life, and getting lost is a scary event, but it can make you stronger. If you can understand Japanese, especially location kanji, you can always rent a navigator system, or bring your own from home. It’s very useful, and a necessary thing for traveling by road in Japan. I do recommend renting a car with navigation as they may provide the best one for you. Knowing which lane to be in is very important as you could get into trouble if you don’t. Just be safe and have fun. 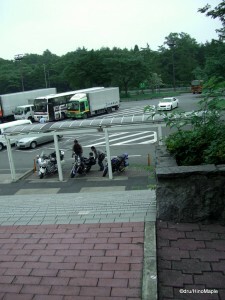 This entry was posted in Automobiles, Hokkaido, Kanto, Tohoku, Travel and tagged Expressway, gas station, Hachinohe, Hokkaido, japan, Japanese driver's license, Japanese gas station, Motorcycle, pay at the pump, Sapporo, Tohoku, Tohoku Expressway, tokyo, Tokyo-to, Touhoku, Touhoku Expressway by Dru. Bookmark the permalink.